The 1956 World Series of Major League Baseball was played between the New York Yankees (representing the American League) and the defending champion Brooklyn Dodgers (representing the National League) during the month of October 1956. The Series was a rematch of the 1955 World Series. 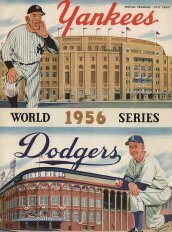 It was the last all-New York Series until 2000, due to the Dodgers and Giants relocating after the 1957 season, to Los Angeles and San Francisco, respectively. The Yankees won the Series in seven games, 4–3, capturing their seventeenth championship. Brooklyn won Games 1 and 2, but New York pitchers threw five consecutive complete games (Games 3–7) to cap off the comeback. The highlight was Don Larsen's perfect game in Game 5, the only no-hitter in the history of major league post-season play. Larsen was named the Series MVP for his achievement. This was the last World Series to date not to have scheduled off days (although Game 2 was postponed a day due to rain). Once again, the eyes of the baseball world were on the bright lights of New York City (for the fourth time in five years) as the Brooklyn Dodgers and New York Yankees met on familiar ground for the coveted World Series championship. The "Bronx Bombers" had bested "the Bums" in three out of the four meetings, but it was the Dodgers who had the last laugh by winning their first title off a dominant Game 7 in '55. Things seemed to pick up right where they had left off for Games 1 and 2 as eleven different members of the Yankees pitching staff were crushed by Brooklyn's bats. The result was a devastating 6-3 opener and an equally crippling 13-8 loss that put the defending champions up two games to none. However as sports often shows us, adversity and pride can turn a sinking ship around. Amazingly the Yankees aces rebounded for five consecutive complete-game performances from five pitchers who combined to allow the Dodgers six runs and twenty-one hits in 45 2/3 innings. In Game 3, a three-run homer by late-August acquisition Enos Slaughter and eight-hit pitching by "The Chairman" Whitey Ford had rallied the Yankees to their first victory, while Tom Sturdivant's six-hitter and homers by both Hank Bauer and Mickey Mantle highlighted the American Leaguers' triumph in Game 4. Despite their back-to-back comebacks, Game 5 is the most notable Yankees performance of the '56 Series (and perhaps one of the most notable in all of baseball). The 64,000+ fans in attendance that day could never have predicted that they were about to witness the birth of a record that would stand into the next millennium or that their ticket stubs would mature into a $2,000.00 piece of sports memorabilia. The Dodgers couldn't have predicted the beating they were about to take either. During the first inning, the Yankees' twenty-seven-year-old right-hander Don Larsen went to his first and only "ball three" count on Pee Wee Reese. From then on, the modest pitcher and his pinstriped teammates worked together on both sides of the plate to deliver an instant classic. In the second inning, Jackie Robinson smashed a line drive that was deflected by Yankees third baseman Andy Carey to shortstop Gil McDougald, who threw out Robinson at first. In the fouth inning, Mickey Mantle hit a low line drive into the right field seats (just inside the foul pole) giving New York the 1-0 lead. In retrospect, "home field advantage" and a little luck sometimes pays off big. If the game had been at Brooklyn's Ebbets Field, "The Mick's" hit would have likely been off the right field screen for a mere double. In the top of the fifth, Gil Hodges (a thirty-two home run man during the regular season) drove a pitch deep into left-center field and right into the outstretched glove of a sprinting Mantle. The spectacular effort has been christened by some as "The Catch" and has been replayed in countless highlight films throughout the years. The next batter, Sandy Amoros, almost spoiled the masterpiece with a line drive toward the right field corner but it curved foul and just missed being a home run. It was a sign of the inevitable as the Dodgers would not get any other opportunities. As the game progressed, so did the anticipation of the crowd and the superstition of the players. Most of the Yankees avoided the pitcher completely in the dugout and even the Yankees' skipper got involved in attempting to preserve Larsen's marvelous momentum. 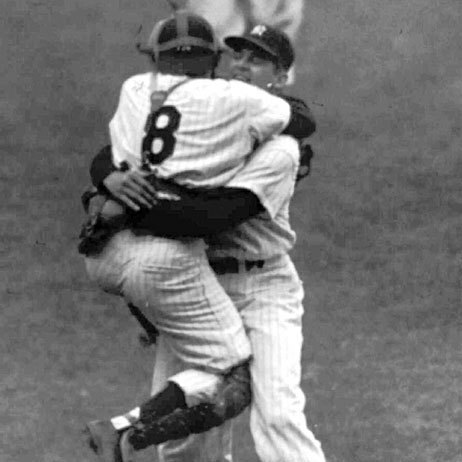 As the ninth inning came to a close, Larsen got a called third strike on pinch-hitter Dale Mitchell to end the game and set off a wild celebration that began with catcher Yogi Berra leaping high into his arms for one of baseball's most photographic moments. Brooklyn's Clem Labine went against Bob Turley for Game 6 and had his team's revenge with an "almost as impressive" 1-0, ten-inning shutout that ended after an Enos Slaughter error turned Robinson's bottom-of-the-tenth drive into a game-winning single. Don Newcombe, a standout on the Dodgers' staff and Johnny Kucks, a Yankee sophomore, matched for the decisive Game 7. Newcombe had just become the first recipient of the Cy Young Award after his twenty-seven victory season in '56, but still had yet to dominate a single postseason outing. Nothing changed in Game 7 as the veteran was knocked for a pair of two-run homers by Berra (who hit a grand slam off him in Game 2) and a bases-empty home run by Elston Howard. Bill Skowron stepped up to the plate in the seventh and finished the job with a grand slam of his own off of Roger Craig who had replaced Newcombe in relief. Kucks returned the favor and held the defending champions to just three-hits in a 9-0 triumph that completed the revival of the New Yorkers' pitching staff and returned the Yankees to post season glory. No game would compare to Game 5 though and no other pitcher would even come close to Larsen's numbers. The Yankee ace pitched another three years in New York before bouncing from team to team over the final seven seasons of a fourteen year career. He retired in 1967 with a forgettable career record of 81-91, failing again to ever approach the heights he achieved on that October afternoon in 1956. Still, he is mainly remembered for being perfect where perfection is simply not possible and his record stands to this very day.